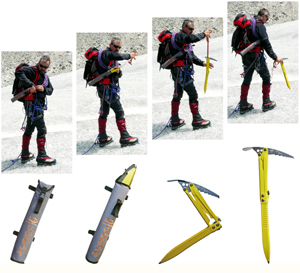 "ÀLPICO" (ALPIne COmpanion), is the revolution in design of piolets type B; it is a patented invention that meets the specific safety requirements while in mountain. Every single aspect has been studied to go beyond the limits of traditional piolets. When in use, it offers the efficiency and resistance of a long traditional piolet (60 cm), complying with the specifications of structural resistance required by UIAA CE EN13089 tests for anchor piolets (type B). The particular U shape of the lower part is studied to guarantee a better holding on soft snow and therefore a safer anchoring. When it is not in use, "Àlpico" can be easily folded, reducing the encumbrance to the minimum and automatically protecting from the sharp parts. For this reason it can be held within easy reach in case of emergency. Àlpico is provided with a robust and practical case that can be hung up on the backpack belt or harness. In such a way it does not obstruct going forward, neither climbing nor going up a via ferrata. In case of immediate need, 8 seconds are enough to have a safety device in your hand, that is able to stop a possible fall, and help you overcoming a hindrance or facing a slope. Àlpico is a "companion" that can be carried with you for any eventuality and always within reach. To live mountains in safety, in any moment.